- Removed Gadget::unregisterChildrenFromVBL() declaration from gadget.h as the function does not exist. - Graphics::dim() draws to correct dimensions. - BitmapButton::getPreferredDimensions() returns the correct size. - AnimButton::getPreferredDimensions() returns the correct size. - Anim button animation continues playing correctly when clicked if disabled. - ListBox::getPreferredDimensions() returns the correct size. - ListBox::draw() clips more effectively. - Removed getEditableData() bodge from bitmap classes; all interaction with bitmap data happens through bitmap methods. 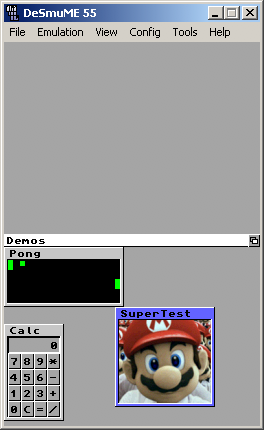 - Moved IK bitmaps out of demo folder/NDS into animbutton test. - ScrollingListBox::getPreferredDimensions() returns the correct size. - SliderHorizontal and SliderVertical produce correct values when they are showing a range of values large enough for the grip to be artificially enlarged. - Scrollbar buttons scroll by amount based on max/min values and height of slider rather than arbitrary value. - Removed ScrollbarVertical and ScrollbarHorizontal setButtonScrollAmount(). - AnimButton animations pause when the button is disabled. - DMA copying function uses DMA for RAM->VRAM copies. - SDL framebuffer code merged into FrameBuffer class. - Added DOS batch files to build examples and tests. - Added grayScale() function to GraphicsUnclipped, Graphics and GraphicsPort. - BitmapButton greys out when disabled. - Added drawBitmapGreyScale() function to GraphicsUnclipped, Graphics and GraphicsPort. - AnimButton greys out when disabled. - ListBox greys out when disabled.